However, I did manage to squeeze in a workout in between. As I’m walking into the office, I’m wearing my Spartan t-shirt and running shoes. The topic of tonight’s lecture is Cardiovascular Endurance, and yes, we will be doing some cardio! As I pull up a chair for some last minute preparations, I hear someone calling my name. Turning around, I see the chair of the English department approaching. “We were just talking about you!”, she says, smiling. [Note that I do not work in English department, so I am understandably curious. Maybe my classroom shenanigans finally caught up with me?]. “My son was just watching the video of Tough Mudder, and I told him about you. Can I introduce you?”. Ha! 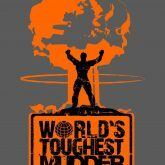 Every opportunity to talk about obstacle racing turns me into a babbling idiot, so the answer is always “Hell yes!”. As I enter her office, I meet Ben, a blonde clear-eyed 14-year old in glasses, who is glued to the laptop screen with familiar images of barb wire and Arctic Enema. He looks up in awe. As I extend my hand, he squeezes it shyly, and then asks, “You… do this?”. He sounds incredulous. I can’t help but smile, realizing what this madness must look like to a person, who is hearing about it for the first time. I think I had this look on my face when I found a video of Warrior Dash few years ago. I sit down, and we watch the video together, as he is showering me with questions. “Are those electric shocks?” [Yes.]. 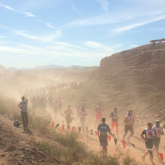 I show Ben my blog, and tell him about Spartan Kids Race. He does not seem convinced. “I know someone who can probably do it”, he says, referring to a friend. “Well, if you wanted to, you could do it too”, I reassure. He shakes his head, and looks down. His mom chimes in, “You may surprise yourself, honey”. 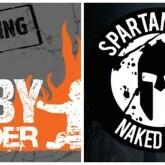 “Besides,” I add, “you still have six months until Spartan Race comes to Toronto”. 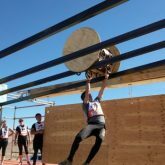 What would the sport of obstacle racing look like by the time Ben is actually old enough to run a Spartan Race or a Tough Mudder? It may no longer be a fad, but simply a sport that was “always there”. Look out, Hobie. A new generation of Spartans is currently in training. It was sunny this morning. We also woke up to some great news (didn’t we?). And the Backstreet Boys are coming out with a new song (what? ).